For OEMs that need intrinsically safe consistent high levels of performance, reliability and stability the 31IS and 32IS (heavy duty version) series sputtered thin film ATEX pressure transducer unit offers an unbeatable price/performance ratio in a small package size. They features all-stainless steel wetted parts, a broad selection of electrical and pressure connections, and a wide choice of electrical outputs. Additionally, 32IS series transducers feature thicker diaphragms and a pressure restrictor to withstand the rigors of cavitations or extreme pressure spikes, delivering years of reliable and stable performance in pulsating applications. The compact construction of this series makes it ideal for installation where space is at a premium. 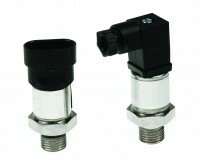 These transducers are also fully RoHS compliant.